In the increasingly competitive E-Commerce landscape, losing sales is a very frustrating feeling. “But I’m not losing sales” you might say. Industry experts have found that the vast majority of online shoppers tend to abandon a webstore due to faulty SEO practices, having slow or inconsistent speed, and an unoptimized user interface design. Do you find it difficult to juggle between your business operations and your E-Commerce website? We are proud to announce BoostSales by Newgen, an innovative fully-managed service offering à la carte solutions for E-Commerce, digital marketing, sales optimization & advanced analytics. BoostSales is designed specifically for merchants who want to optimize their webstores and increase their sales conversions, while minimizing their cost and time investments. Read on to learn how we can help your online business succeed. Want to increase customers through your webstore? Your webstore is the key platform for attracting visitors, engaging them and converting them into paying customers. But alas! A poor user experience can cause high page abandonment rates, low visitor-to-lead conversion rates, and hence a substantial decline in your business. The first 6 seconds of a page visit are critical for a visitor’s decision to stay or leave. Excessive pop-ups, irrelevant/low-resolution images, poor navigation, and cluttered layouts can trigger the visitor to hit the back button instantly. Don’t worry. BoostSales’ experienced team is here to help you. Having over 60 years of combined experience in E-Commerce, our experts find the gaps and issues in your webstore and E-Commerce strategy and go through every element of the site, from the user interface design to the website speed, performance and security. The design of your webstore is one of the most fundamental aspects of your online store. After all, your website is not just an online presence, it’s your online storefront. Is your site attractive enough to make a visitor stay on it once they arrive? Does it provide clear and relevant information to the visitor about your brand and offerings? Is it easy to navigate across all devices? If you said no to any of these, it is likely that you’re losing a significant amount of potential customers due to an ineffectual webstore. This is why our designers make sure they create a user-friendly webstore that best matches your brand identity. We make sure that every web element is optimized for ease of use and sales conversion, from the search bar to the shopping cart, to give your visitors the best user experience possible and convert more of them into customers. In the age of evolving technology, why should your webstore lag behind? In order to increase conversion rates and website traffic, it is essential that you provide the visitors with a good user experience. We can develop new features, customized designs, plugins and extensions to take your webstore to the next level. Our web development team will be able to optimize your webstore platform to ensure the smoothest and most consistent user experiences for every visitor. What’s more, we can upgrade your webstore to be mobile ready, since customers are increasingly shopping on the go and expect a seamless shopping experience at their fingertips. We can build E-Commerce apps for your brand across all major platforms (iOS, Android, Windows Mobile). In today’s virtual society, it is essential to market your brand online. If a potential customer can’t instantly find you, they’ll move on to one of your competitors in the click of a button. BoostSales can reinvigorate your online brand with customized campaign-focused digital marketing campaigns, which target the right audience and attract the right customers. We implement coordinated promotional campaigns which incorporate all channels: SEO, Social Media marketing, PPC Advertising, Targeted Email marketing, SMS marketing, Coupon rewards, and others. We provide in-depth analytics on every aspect of your webstore, digital marketing campaigns, and SEO performance. You can easily view and track your store visitors, product conversion rates, A/B testing results, advertisement campaigns and much more. We also provide real-time heatmap reports so you can track your visitor interaction easily; this also helps us optimize your webstore layouts for maximum engagement and conversion. 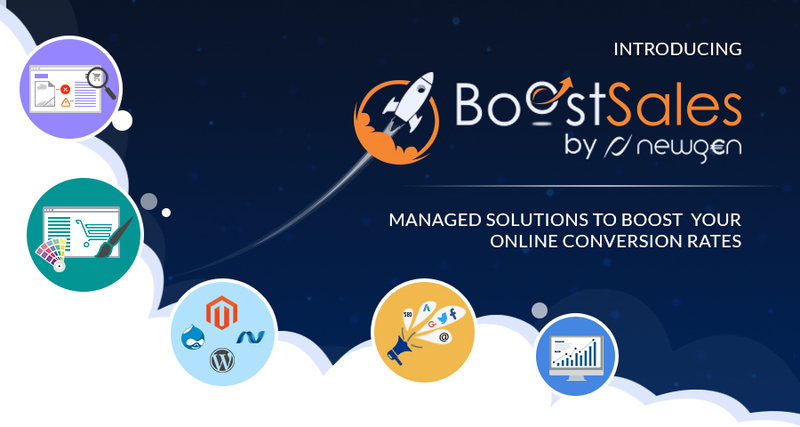 Get ready to skyrocket your sales with BoostSales! From webstore design to digital marketing, we manage all your E-Commerce needs with an uncompromising focus on customer experience and sales optimization – all at 70% less of the cost as compared to the market. BoostSales enables you to focus on your core business, while we optimize your webstore and help you find new customers and increase sales.